Home / -Vintage Video- / 5th Dimension / Vintage Video / Vintage Video #1's: Marilyn McCoo of the 5th Dimension Gets the "Wedding Bell Blues"
Vintage Video #1's: Marilyn McCoo of the 5th Dimension Gets the "Wedding Bell Blues"
The 5th Dimension were well into their long and successful career when they released their version of Laura Nyro's "Wedding Bell Blues". Nyro wrote the song in 1966 at the age of 18 and recorded it that same year for what would become the album More Than a New Discovery. The song was released as a single but stalled out at 102 on the Bubbling Under the Hot 100 chart even though it was on that tally for twelve weeks. The 5th Dimension already had success with some of Nyro's songs, including "Stone Soul Picnic" and "Sweet Blindness", when they decided to record "Wedding Bell Blues" for their album The Age of Aquarius. The song would have to wait a bit, though, to come out as a single as their huge smash "Aquarius/Let the Sunshine In (The Flesh Failures)" and the less successful "Workin' on a Groovy Thing" were released first. 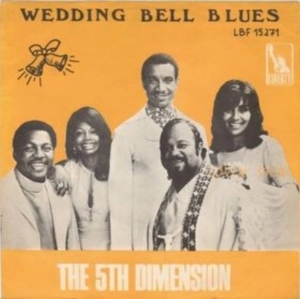 Finally, in September of 1969, "Wedding Bell Blues" came out as a single. On November 1, 1969, 48 years ago today, it hit number 1 on the Adult Contemporary chart where it would stay for two weeks and, a week later, would start a three week run at the top of the Hot 100, the group's second and last chart topper.